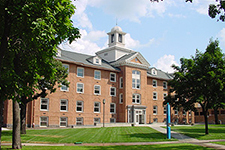 The oldest structure on campus, this building was named for renowned educator and former SCSU president Isabel Lawrence. After standing empty for 30 years, it was renovated to house 50 pairs of students including students in foreign languages and international affairs. The Center for International Studies and offices of foreign language faculty occupy the lower floors. From 5th Avenue turn east on 6th Street S. Follow 6th Street four blocks to 1st Avenue. Turn right, follow the access road behind Atwood Center; Lawrence Hall is on the left. The nearest public parking is the pay lot at 4th Avenue/5th Street or the James W. Miller Learning Resources Center pay lot. Short Term parking is available near the Atwood Center. Street parking may also be available.